Hardkernel ODROID-XU may have been the first low cost big.LITTLE development board, but since it’s using Exynos 5410 SoC, big.LITTLE processing is limited to cluster migration that means using A15 cores or A7 cores. 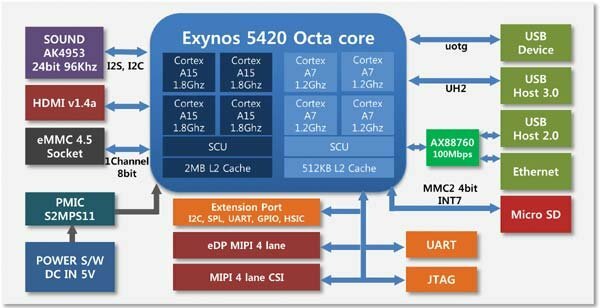 Insignal’s Arndale Octa was also initially announced with Exynos 5410, but the good news is that we’ll soon get a fully functional big.LITTLE development board as Arndale Octa has been upgraded to Exynos 5420 Octa-core SoC. This board will support both In-Kernel Switching (IKS) and Global Task Scheduling (GTS) implementations, and be officially supported by Linaro like the first Arndale board based on Exynos 5250 dual core Cortex A15. Storage – eMMC 4.5 socket + microSD card slot. (Update: There may be a 4GB eMMC soldered to the board instead of an eMMC 4.5 socket, but that’s unclear for now). Display Port MIPI DSI/eDP connector. The board will support both Ubuntu and Android (Linaro). The Arndale Octa Wiki is currently updated, but there’s already a lot of instructions, that may or may not be up-to-date. You’ll notice there’s no storage of the board, so you’ll have to boot from SD card, or purchase an eMMC module somewhere. 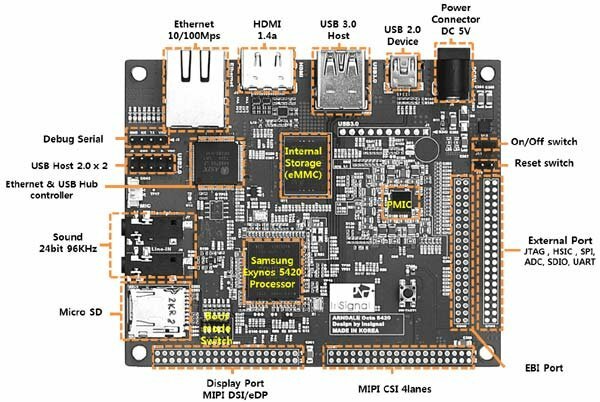 The company used to sell their boards via Howchip.com, but the latest Arndale Octa board is currently available for $179 via Pyrustek, which is completely new. This price is only valid for the first 1,000 boards, and including a free serial debug board, after the regular price will be $199. You’ll also need to add delivery via Fedex or EXW (Ex Works). To my country Fedex was about $42, and if, like me, you’ve never heard about Ex Works before, that means you’d have to pick up the package in South Korea in Pyrustek’s warehouse. Delivery is expected within 4 weeks, and at this time, you can only pay by bank transfer, with credit card payments available later. You can also purchase a 7″ LCD display (1024×600) with a capacitive touchscreen for $199, as well as a $59 accessories package with a 4GB micro SD card, an HDMI Cable, a serial cable (9pin female to 9pin female), a USB cable, a power supply (DC 5V 3A – jack diameters [+]2mm Internal, [-]5.5mm External), and for the 1,000 first order, a power conversion adapter (110V – 220V). I had the original Arndale board and I must say that the software support was terrible. InSignal never really listened to bug reports or feature requests, and has now stopped updating the firmware completely. Not really going to bother with this new Arndale Octa. I still have the original Arndale and while I’m likewise somewhat disappointed that it’s not supported like a consumer device, in retrospect I’ll just have to admit that it was mostly a case of misplaced expectations. Arndales were never meant to be consumer devices, which you could just use. I believe they were designed to help developers get started on Samsung processors and that Samsung subsidized that project through money and shared coded/documentation. Samsung didn’t pay for continued support and the volumes sold were never enough (nor intended to be) to pay for continued support, either. There must be an incredible amount of politics involved there and it seems that the initiative to develop a hardkernel like alternative (the openbrix) was stopped by Samsung, because it threatened to turn Samsungs “Mercedes engine” into something like a $50 HDMI stick. At least that’s how I read it but I could be totally wrong. I am a little surprised this board comes out this late and I must admit it looks more like the sort of thing that hardkernel would produce. Those guys seem to have been given a batch of 5410s after ages of begging that Samsung could no longer use for anything meaningful, since it turned out the cache coherency issue with the PowerVR GPU could only be solved via a full cache flush when switching between A7 and A15: That rendered the chip useless for any mobile deployment. It hurt the Exynos 5 pretty badly and lack of an internal LTE modem probably didn’t help. While the 5420 won’t share the cache coherency issue it really is already somewhat dated, before it ever took off properly. I wonder who will now, if ever, invest much into an architecture which will become superceded by 64-bit designs very fast. This board should have come out a year ago to make a difference. Today I don’t quite see the point of it as being a Samsung subsidized development kickstarter and I wonder if Linaro really will support it: Those guys aren’t really into device support either and only just support the bare minimum of functionality on the older Arndale, to do what *they* are interested in (mostly kernel development, KVM and Xen). While I still would love to have one of these, especially since it is so much more cute than the older Arndale, I find the lack of a SATA port (Samsung obviously can’t decide and includes SATA only in every other generation of their SoCs) very painful for a stationary mini-PC, which I’d want to use it for. That at least the older Arndale has and it even supports SATA port multiplier which together with Gbit Ethernet support via USB 3 makes it also a credible mini-server. But without SATA and the ability to add more RAM (Xen and KVM use would indeed profit from more than 3GB)? If the eMMC is soldered on most likely it will be as small as 4GB to keep the cost down, which means storage and gigabit Ethernet will have to share USB 3. I’ve been wishing for the next logical growth step beyond the original Arndale and something more like a hardkernel device or even an Exynos 5420 based Minix Neo x8. I guess it’s a good think they don’t accept credit cards yet, or I might have just hit “buy” anyway. Hi we are facing the frequent restart of arndale octa 5420 board when we try to execute our kernel on this board can any help us to avoid this kind of issue.